(a) What is the formula of this compound? (b) Identify the phases present in the numbered areas of the phase diagram. (c) Identify the points a through e.
(d) What are the solubilities of A in B and of B in A? 8.8 Cesium and rubidium form complete solutions in both the solid and liquid phases. 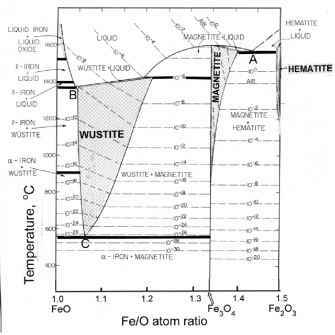 In the phase diagram shown below, a minimum in the liquidus-solidus occurs at 282 K where the mole fractions in both liquid and solid are 0.5. (a) Assuming the liquid solution to behave ideally, calculate the activity coefficients of Cs and Rb in the solid phase. (b) Does the solid phase obey regular solution theory?